"Improving NDIS market effectiveness and equity" asks what helps to manage the new National Disability Insurance Scheme (NDIS) market so that services remain available, accessible and of good quality. This project aims to develop methodologies to identify thin markets in the public service sector. Thin markets, where there are a low number of buyers or low number of sellers, are a major risk for governments utilising a personalised approach to service delivery. When markets aren’t in place, or there aren’t enough providers within them (known as market failures or thin markets) the goals of the NDIS to create choice and control for people with a disability cannot be reached. We are developing innovative new methods to allow governments to track markets in contexts like the NDIS. We are using a new method called ‘Functional Network Analysis’ in three case study areas across Australia - Canberra region, north east Melbourne area and the Goldfields in Western Australia. Through interviews and focus groups we will bring together practitioners, service providers, and government to identify how, and who, can address market issues. This process develops ‘market stewardship’ capabilities for the NDIS. All our research publications are available for download here. Malbon E, Alexander D, Carey G, Reeders D, Green C, Dickinson H & Kavanagh A. Adapting to a marketized system: Network analysis of a personalisation scheme in early implementation. Health Social Care Community, 27 August 2018 (Epub). Malbon E, Carey G, Reeders D. Accountability within new public governance and the case of the Australian National Disability Scheme’, Social Policy and Administration, 2018, 1-14. Needham C & Dickinson H. Any one of us could be among that number: Comparing the Policy Narratives for Individualized Disability Funding in Australia and England, Social Policy and Administration, 2018, 52; 731-749. Carey G, Malbon E, Olney S & Reeders D. The personalisation agenda: the case of the Australian National Disability Insurance Scheme, International Review of Sociology, 2018, 28:1, 20-34. Malbon E, Carey G & Dickinson H. Accountability in Public Service Quasi-markets: The Case of the Australian National Disability Insurance Scheme, Australian Journal of Public Administration, vol. 77, pp. 468-481. Carey G, Malbon E, Reeders D, Kavanagh A & Llewellyn G. Redressing or entrenching social and health inequities through policy implementation? Examining personalised budgets through the Australian National Disability Insurance Scheme’, International Journal for Equity in Health, 2017, 16:192. Dickinson H. Individual funding systems: what works? Evidence Base Journal, 6 October 2017. Carey G & Dickinson H. A longitudinal study of the implementation experiences of the Australian National Disability Insurance Scheme: Investigating transformative policy change, BMC Health Services Research, 17 August 2017. Carey G, Kay A & Nevile A. Institutional legacies and ‘sticky layers’: what happens in cases of transformative change?, Administration and Society, 19 April 2017 (Epub). Dickinson H & Carey G. Managing care integration during the implementation of large-scale reforms: The case of the Australian National Disability Insurance Scheme, Journal of Integrated Care, vol. 25, pp. 6-16. 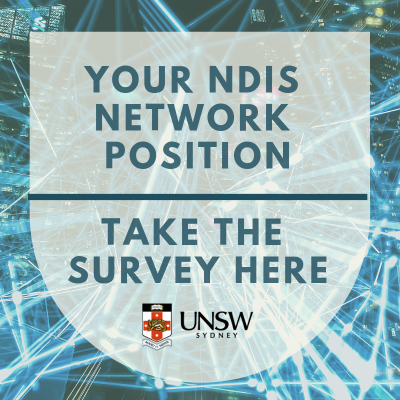 Green C, Malbon E, Carey G, Dickinson H & Reeders D. Competition and collaboration between service providers in the NDIS, Centre for Social Impact, University of New South Wales 2018.